UPDATE: Corrected a few typos. One appeared in Figure 1, which I corrected and replaced. Thanks to Werner Brozek for finding them. As we’ve seen in numerous model-data comparisons, there are few similarities between modeled and observed surface temperatures and precipitation. See here, here, here, here, and here for examples. We’ve compared satellite-era sea surface temperature to model outputs in past posts (examples here, here and here), but we used model outputs from climate models stored in the CMIP3 archive, which was prepared for the 2007 4th Assessment Report from the IPCC. In this post, we’re using the outputs of newer CMIP5 models, prepared for the IPCC’s upcoming 5th Assessment Report. Scenario RCP6.0 for the CMIP5 models is presented because it most closely matches the climate forcings of the scenario called SRES A1B, which was widely cited in the past. Preliminary Note: We’re looking at the multi-model ensemble mean (the average of all of the individual simulations in the respective archives) because the model mean is the best representation of how the models are programmed and tuned to respond to manmade greenhouse gases. Phrased another way, if the sea surface temperatures were warmed by greenhouse gases, the multi-model mean presents how those sea surface temperatures would have warmed, according to the models. That’s what we’re interested in seeing. More on this later. In general, the multi-model mean of the CMIP5 simulations of global sea surface temperature anomalies have a slightly higher linear trend than the CMIP3 models. See Figure 1. The CMIP5 models have a stronger and more prolonged dip in response to the eruption of Mount Pinatubo in 1991. They also have a curious additional warming from 2000 to 2010 that almost appears to be an over-response, a kind of excessive rebound, from that volcano. 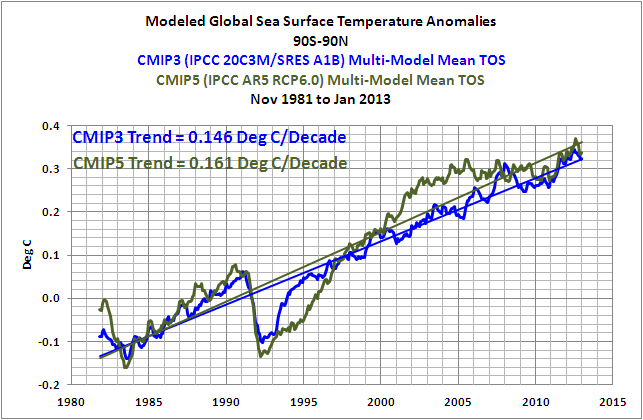 Two notes: First, now consider that the observed trend in global sea surface temperature anomalies is almost half the trend shown by the CMIP5 models. That’s a major difference, suggesting that researchers haven’t yet figured out how and why sea surface temperatures warm. Second, when looking at the sea surface temperature outputs of climate models, keep in mind that different radiative forcings have different impacts on the oceans. First, let’s discuss downward shortwave radiation. It’s also known as visible sunlight and penetrating solar radiation, the latter because sunlight penetrates the oceans to depths of 100 meters, decreasing in strength with depth. The dips and rebounds seen in Figure 1, beginning in 1991, are caused by the sun-blocking aerosols spewed into the stratosphere during the explosive volcanic eruption of Mount Pinatubo. They are related to downward shortwave radiation. Downward shortwave radiation from the sun is not to be confused with downward longwave radiation, infrared radiation, from manmade greenhouse gases. Infrared radiation can only penetrate the top few millimeters of the ocean, and that’s where evaporation takes place, leading some oceanographers and physicists to believe that the increases in manmade greenhouse gases could not have caused the oceans to warm. The data supports that. In summary, the observed and modeled sea surface temperatures both show dips in responses to volcanic eruptions, which are responses to decreases in sunlight, but that doesn’t mean the modelers are correct in their assumptions that infrared radiation from greenhouse gases caused the warming of sea surface temperatures. 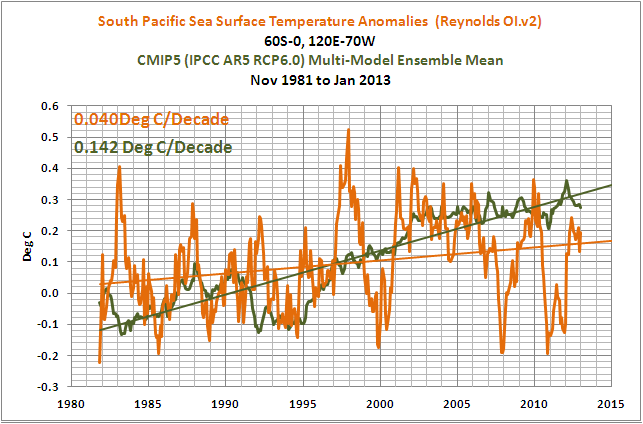 Figures 2, 3 and 4 are model-data trend comparisons of sea surface temperature anomalies for the Pacific, Atlantic and Indian Oceans, respectively. But they aren’t time-series graphs. Looking from left to right along the horizontal (x) axis, “-90” represents the South Pole, “0” the equator, and the North Pole is at “90”. The units of the vertical (y) axis are degrees C per decade—based on the calculated linear trend. Each data point represents the linear trend in degrees C per decade for a 5 degree latitude band, where, for example, the data point at -82.5 (82.5S) latitude represents the linear trend of the latitudes of 85S-80S. The data points representing the trends then work northward in 5 degree increments, 80S-75S, 75S-70S, and so on, using the same longitudes. 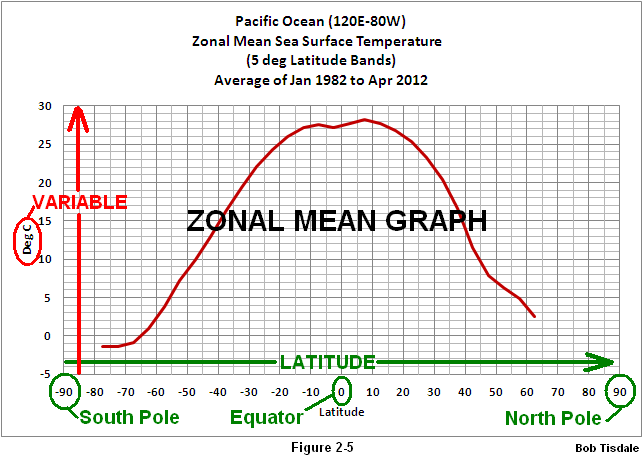 The average temperatures of latitude bands are called the “zonal mean” temperatures by climate scientists, hence the use of that term in the title blocks. 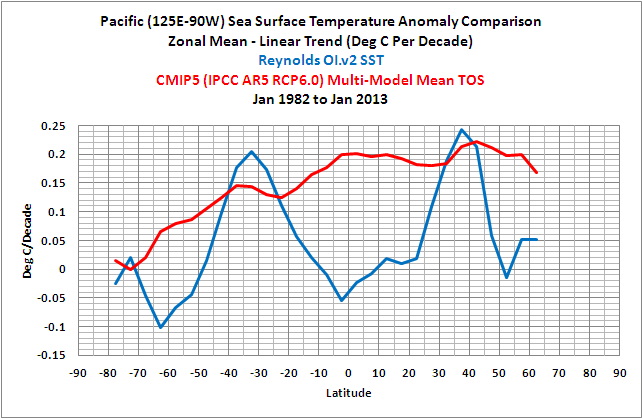 Figure 2 shows the observed and modeled sea surface temperature trends for the Pacific Ocean (longitudes of 125E-90W) on a zonal-mean basis. 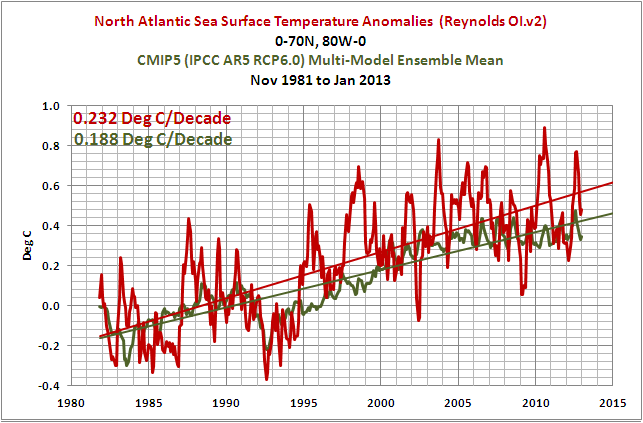 At and near the equator, observed sea surface temperatures cooled since November 1981, the start of the dataset. And the highest observed warming in both hemispheres occurred at the mid-latitudes of the Pacific. The observed warming trends at mid-latitudes, with no warming near the equator, suggest that warm water was distributed poleward by ocean currents. In the Pacific, that happens when El Niño events dominate, which was the case during this period, causing the excessive distribution of warm water toward those latitudes. 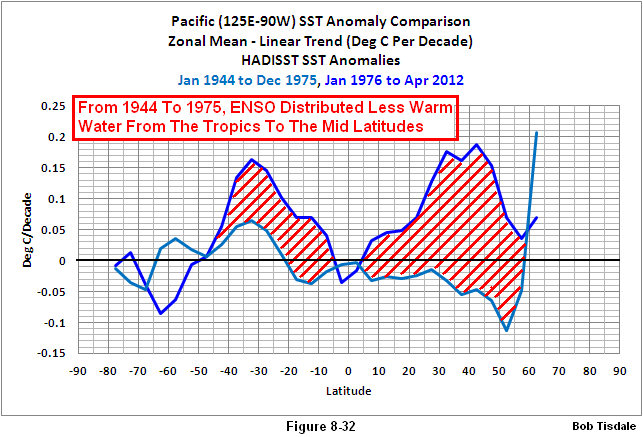 Refer to this comparison of Pacific trends on a zonal-mean basis for the periods of 1944 to 1975 and 1976 to 2011. It’s Figure 8-32 from my ebook Who Turned on the Heat? From 1944 to 1975, El Nino and La Niña events were more evenly matched, but slightly weighted toward La Niña. During that period, less warm water was released from the tropical Pacific by El Niños and distributed toward the poles. 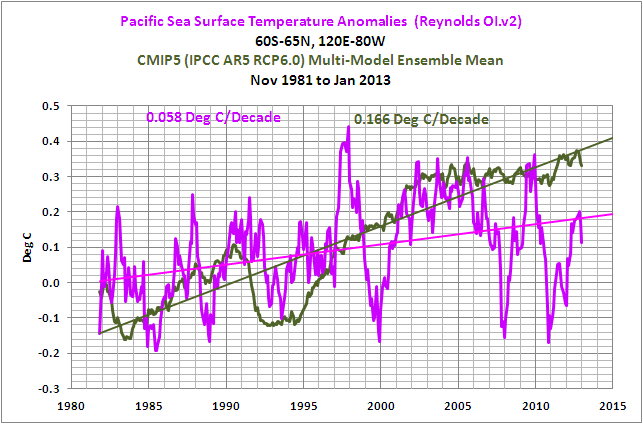 But from 1976-2011, El Niño events dominated, so more warm tropical waters were distributed to the mid-latitudes. In looking at the unrealistic trends presented by the models, consider that climate models do not simulate the processes of El Niño and La Niña properly. See the discussion of Guilyardi et al (2009) here. To overcome those failings, the sea surface temperatures in climate models have to be forced by greenhouse gases to create very high warming trends in the tropics, where observations show little warming. Now consider that the Pacific Ocean stretches almost halfway around the globe at the equator and you’ll understand the magnitude of those failings. Sunlight is intense in the tropics, and logically the sea surface temperatures (absolute) are warmest there. (That linked illustration is Figure 2.5 from Who Turned on the Heat?) And because sunlight is less intense at the poles, the sea surface temperatures are cold at high latitudes, to the point where the sea surface freezes at the poles. 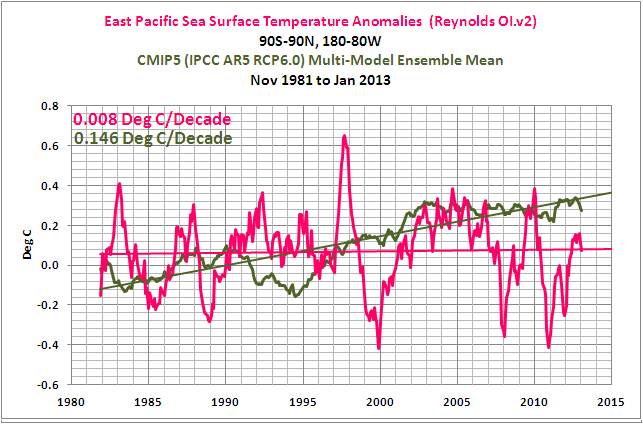 It almost appears as though the climate models show significant warming in the tropical Pacific over the past 31 years because the sea surface temperatures (absolute) are warm there. 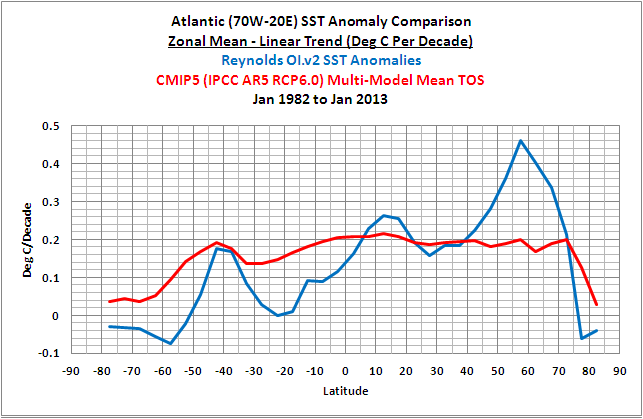 Again on a zonal-mean basis, Figure 3 shows the modeled and observed trends in sea surface temperature anomalies for the Atlantic Ocean (longitudes 70W-20E). The models overestimate the warming in the South Atlantic and underestimate it North Atlantic, especially towards the high latitudes. In fact, the models show just about the same warming trends from 40S to 70N, while the trends of the observations change greatly over those latitudes. 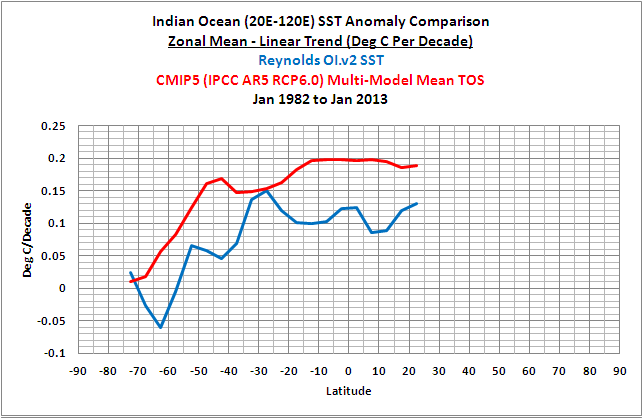 The last trend comparison on a zonal-mean basis is for the Indian Ocean (20E-120E), Figure 4. 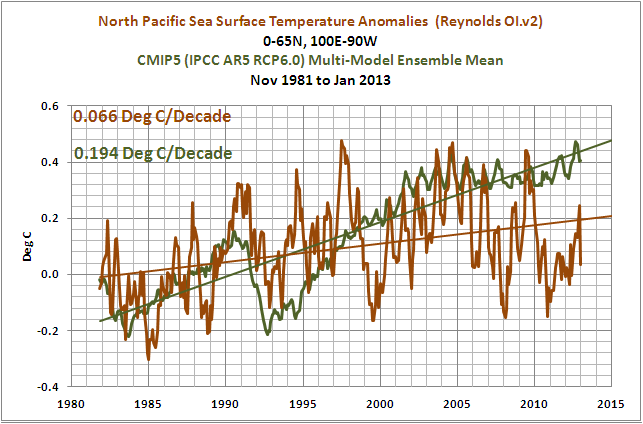 Basically, the models show too much warming at most latitudes. 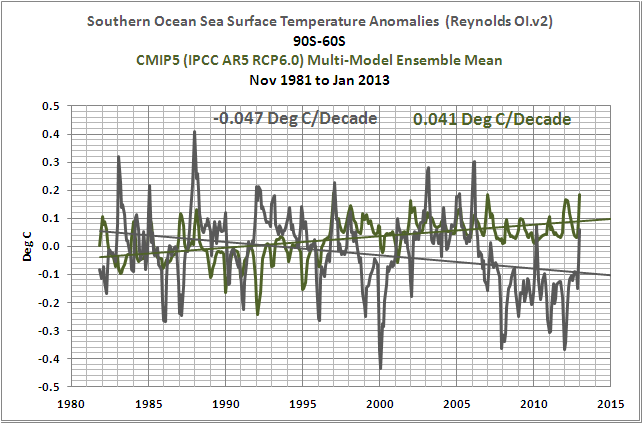 Note: The base period for anomalies is 1971-2000, the standard at the NOAA NOMADS website for the Reynolds OI.v2 data. For the rest of the model-data comparisons in this post, we’re resorting to standard time-series graphs for the monthly anomalies, with time in years as the x-axis and sea surface temperature anomalies in deg C as the y-axis. As illustrated in Figure 5, the models inidicate that if greenhouse gases warmed sea surface temperatures, they should have warmed globally at a rate that’s almost twice the observed warming. 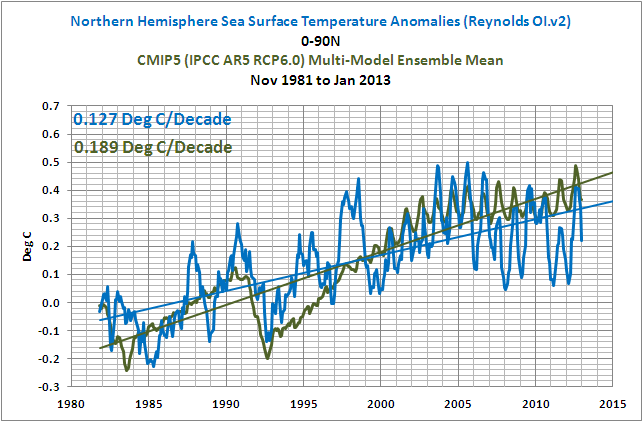 In the Northern Hemisphere, Figure 6, the sea surface temperatures warmed faster due to multidecadal variations in the North Atlantic and North Pacific (Figure 10 from this post), so the models are exploiting the natural variations to acquire a better match. But the sea surface temperatures in the Southern Hemisphere warmed at a much lower rate, Figure 7, so the disparity there is much greater. 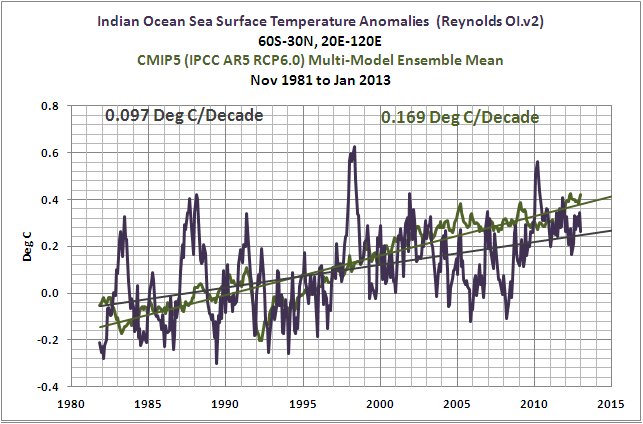 Apparently, the modelers still have no idea how to simulate the warming of the oceans. This will be even more obvious in individual ocean basins that follow. The following graphs present the comparisons for the individual ocean basins per hemisphere, and a couple of subsets related to El Niño-Southern Oscillation. They’re being provided without commentary. The coordinates are listed in the title blocks of the graphs. 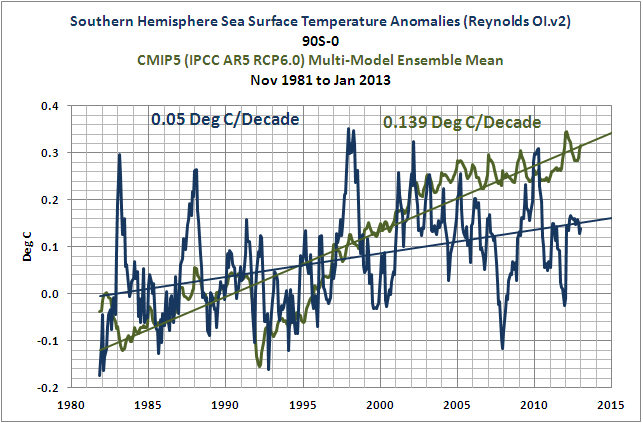 Table 1 presents the observed and modeled linear trends for the sea surface temperature subsets presented in the post, for the period of November 1981 to January 2012 2013. I’ve also included the differences between the modeled and observed trends and the differences as a percentage of the observed trends. [Difference as a Percentage of Observed = ((Model Trend – Obs. Trend)/Obs. Trend)*100]. Click on Table 1 for a full-sized version. About 70% of the planet Earth is covered by water: oceans, seas and lakes. As illustrated in this post, the manmade greenhouse gas-forced component (the multi-model mean) of the climate models prepared for the IPCC’s upcoming 5th Assessment Report shows no similarity to the warming of the sea surface temperatures exhibited by those oceans over the past 31 years. In other words, the models show no skill at being able to simulate the sea surface temperatures of the global oceans for the past 3+ decades—and since the start of the 20th Century, that’s the period when climate models perform at their best. One of the biggest problems facing the climate science community is the fact that ocean heat content and satellite-era sea surface temperatures indicate the oceans warmed naturally. This was illustrated and discussed in detail in my essay titled “The Manmade Global Warming Challenge”. The introductory blog post is here and it can be downloaded here (42MB). This was also presented in my 2-part YouTube video series titled “The Natural Warming of the Global Oceans”. YouTube links: Part 1 and Part 2. And it was illustrated and discussed, in minute detail, in my ebook Who Turned on the Heat? which was introduced in the blog post “Everything Your Ever Wanted to Know about El Niño and La Niña”. Who Turned on the Heat? is available for sale only in pdf form here. Price US$8.00. Note: There’s no need to open a PayPal account. Simply scroll down to the “Don’t Have a PayPal Account” purchase option. 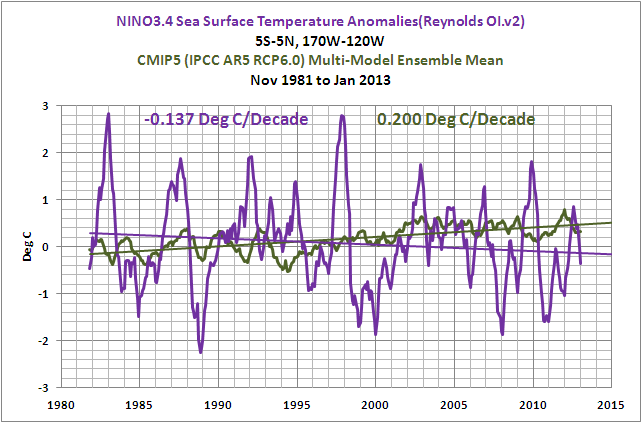 The Reynolds Optimally Interpolated Sea Surface Temperature Data are available through the NOAA National Operational Model Archive & Distribution System (NOMADS) website. The CMIP5 Sea Surface Temperature simulation outputs (identified as TOS, assumedly for Temperature of the Ocean Surface) are available through the KNMI Climate Explorer Monthly CMIP5 scenario runs webpage. This entry was posted in Model-Data Comparison SST. Bookmark the permalink. I know you are very interested in the mechanics behind ENSO. Have you taken a look at the relationship between SST anomalies in Southern Ocean around the beginning of the year to the following winter’s ENSO mode? There seems to be a fairly good negative correlation between the sudden dips and spikes at the beginning of a calendar year and the ENSO mode the following winter. Some obvious exceptions: 1995/96/97. But could the failure of ENSO to respond to the cooling of the southern ocean in 1996/97 just led to the unusually large El Nino in 1997/98? As in, most of the time, the southern ocean/ENSO connection connects the following year.. but when it doesn’t, it could mean an even bigger event the next year? It happened again in 2005/06/07.. what should have been a La Nina in 2006/07 was actually a weak/moderate El Nino… but then the 2007/08 event was significant in that it was largely ocean driven rather than through the atmsopheric SOI. It’s something worth looking at. And if my suspicions are correct, there’s a good chance La Nina will be making a return for winter 2013/14. 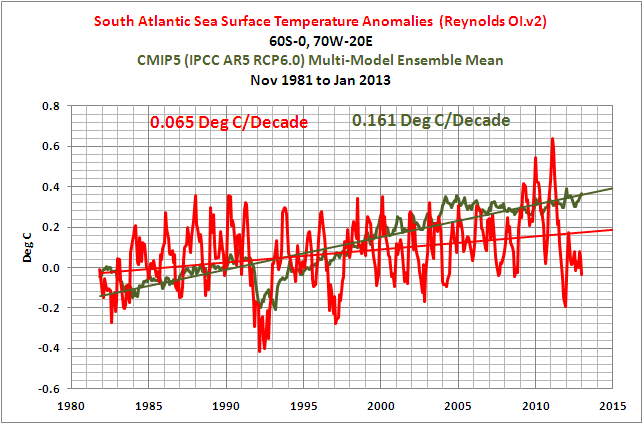 I should clarify: The southern ocean showed a cool spike in early 1996. By my theory, it would mean an El Nino in 1996/97… but even as the southern ocean was quite warm in early 1997, neutral ENSO conditions prevailed.. but by spring 1997, a massive El Nino event was imminent (starting earlier than most El Nino events). After the warm spike in 2005/06 failed to mean La Nina in 2006/07… that El Nino collapsed unusually early and then as the summer wore on, an upwelling driven la Nina formed. Bryan S: Thanks. I’ll have to take a more detailed look at the relationship you’re describing. It’s unfortunate that we don’t have long-term data for the Southern Ocean, to determine the frequency and magnitude of any multidecadal variations there–and their influence on the tropical Pacific. Pingback: The Sun Was in My Eyes – Was It More Likely Over the Past 3-Plus Decades? | Watts Up With That? Pingback: Model-Data Comparison with Trend Maps: CMIP5 (IPCC AR5) Models vs New GISS Land-Ocean Temperature Index | Watts Up With That? Thanks for exposing such little skill. ” We find convergence after 5 runs for model runs of length 80 years and after 20 runs (see Fig. 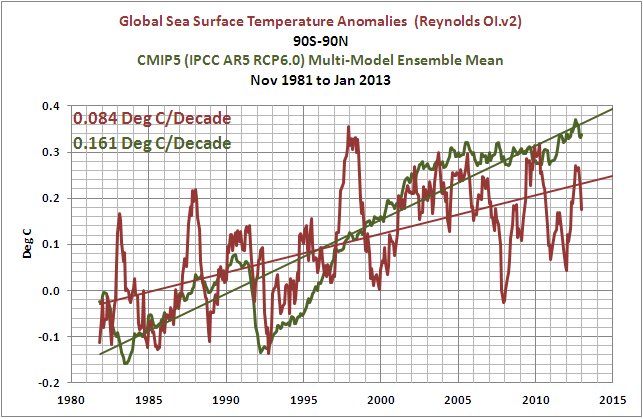 3) for a segment length of 20 years (which is typical of the models in the IPCC compilation; see Fig. 1). Empirically, it appears that convergence is achieved in 400 run-years – i.e., (20 x 20), (10 x 40), and (5 x 80).” . . .
“the IPCC’s compilation of 22 ‘20CEN’ models has five models with just one run, five with 2 runs, and only seven with 4 or more runs.” . . .
David L. Hagen, thanks for the link. Pingback: On Holland and Bruyère (2013) “Recent Intense Hurricane Response to Global Climate Change” | Watts Up With That? Pingback: Introduction to the Hadley Centre’s HadCRUH Specific Humidity Dataset | Watts Up With That? 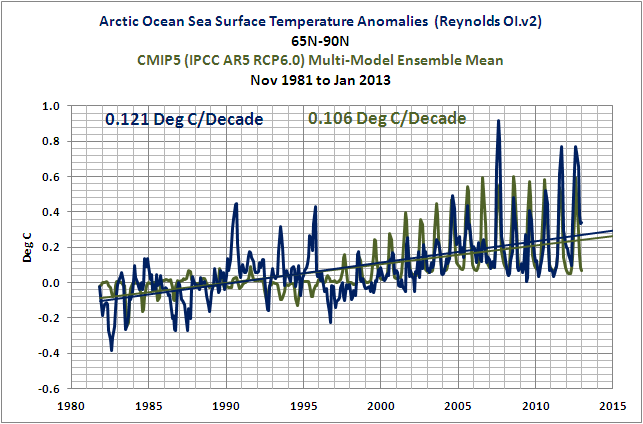 Pingback: Model-Data Comparison: Hemispheric Sea Ice Area | Watts Up With That? Pingback: Sea Surface Temperature Anomalies of Tropical Storm Chantal’s Forecasted Storm Track | Watts Up With That? Pingback: California Drought – A Novel Statistical Analysis of Unrealistic Climate Models and of a Reanalysis That Should Not Be Equated with Reality | Watts Up With That? Pingback: On the Elusive Absolute Global Mean Surface Temperature – A Model-Data Comparison | Watts Up With That?